I’ve been in love a few times in my life. 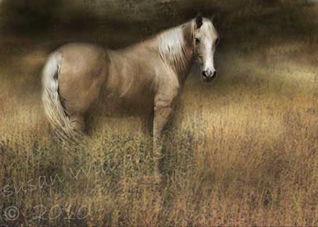 The most recent mare I fell head-over-hooves for was a beautiful palomino Tennessee Walker, named Annie. Oh my gosh, that girl was a beauty! Long blond hair, lovely big hip, with the most elegant sashay as she’d walk down the road. My heart went pitter-patter every time she and her person rode by our barn. I’d not seen her in awhile. I would watch the road hoping she would come by, but nothing. Then, a long time after I’d last seen her, Annie’s person stopped by our barn and told a friend that Annie was gone. She’d gotten into something poisonous and had severely foundered. Her owner tearfully shared that they had tried for months to save her, but she was in so much pain and her coffin bone had rotated so far, that the vet had suggested that the kindest thing to do was to end her suffering and put her down. Her owner was still distraught about the decision, not sure she had made the right choice. Annie’s person’s guilt and self-doubt was tearing her apart. It’s a blessing to us horses that we live in the moment. We don’t fear death because we don’t project our thoughts into the future and wonder what it will be like when we leave this physical existence. We are now. Being now also means that in spirit we don’t have judgment as to the reason why we may have left the physical world. Of course our natural instinct is to survive, and our fight and flight instincts will kick in if we are threatened, but that’s not a conscious thought. That’s programmed impulse. Deciding it’s time to help a beloved friend move to the next plane is one of the most difficult things an animal lover has to do. There will almost always be a sliver of doubt as to whether or not it was the right decision or the right moment to act. What if your friend could have been saved? What if they resent you for hurrying them down that path? What if the animal’s ghost is hovering around, upset that you made the ultimate decision for them? Making the final resolution for a horse, more than any other kind of animal, is especially hard on people. One of the reasons is that there is a very different kind of mutual trust that has to be in place for a person to ride and work with an animal of a horse’s immense size and power. Taking a horse’s life almost always feels like a betrayal of that special trust, even when the person knows it will end unavoidable suffering. That mixture of guilt with intense grief is one of the most painful emotional states a human being can possibly experience. If you’ve been one of those who has loved and lost a horse, especially when you were the one who had to make the final decision, you know what I’m taking about. I just want to assure you that horses do not hold a grudge, and do not fear or resent death. It’s the final kindness you do for us, letting us move on in a quiet and painless manner. Our wild cousins usually face much worse when the end comes. We really do appreciate you making that ultimate decision, and gently releasing us from our damaged flesh and blood earth-ship. I know that when it’s my time, Jane will be devastated. I feel her love for me and know her grief will be nearly unbearable for a while. But we both also know that death is part of life, and in her grief she will find joy in the memories of our wonderful time together. She will heal, as will I. If you’ve been through this and have been questioning yourself, let me assure you that you did the right thing. Your horse knows you love him or her and holds no resentment at being helped along to the next big adventure. If you need to, please forgive yourself. Your horse already has, because he or she knows there was nothing to forgive.